Tourists come from around the world to hike “The Circuit”, a trail around the Paine massif in Torres del Paine National Park in Patagonia. On the west side of the Circuit there are three deep gorges, or “quebradas”, which cross the trail. 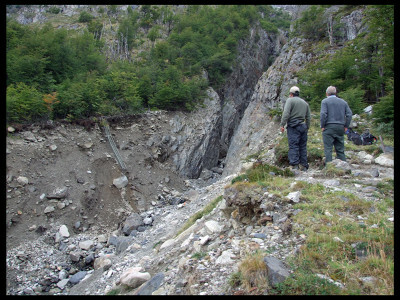 Each year after the snow melts, park rangers from CONAF, Chile’s National Park service, must re-establish hiking trails through the gorges. The second gorge has been eroding particularly rapidly over the past decade, making the crossing increasingly difficult and dangerous. Richard Braunlich, a structural engineer and ConservationVIP volunteer, first surveyed the site and did an initial design for a bridge in 2009. But before proceeding with the bridge on the Second Quebrada, we decided we first needed to construct the Bridge over the First Quebrada to improve accessibility to the Second Quebrada project. In 2014, CONAF determined that construction of a bridge to cross the Second Quebrada was a top priority for the Park. ConservationVIP set about raising money for the materials while Richard concentrated on design details, purchasing materials, and assembling the right team of people for the special challenges presented by the site. Yosemite National Park, which is a sister park to Torres del Paine, agreed to send two employees with excellent cable, rope, and rock skills to assist with the critical first two weeks of construction. CONAF purchased a rock drill and focused on logistical support. In January and February of 2015, Richard led a U.S. and Chilean team which constructed a 52 meter (170 feet) long hanging bridge across the Second Quebrada. When the bridge was completed, we were finally able to answer the question “How deep is that gorge?” At the center of the bridge, the depth of the gorge is 45 meters (150 feet). Click here to see photos of the construction on our Facebook Album.